These snowflakes arrived very quickly and I was immediately impressed with the way that they looked. I ordered 16, and all were intact and seemed well-made. I was most surprised by the fact that they are not only ornaments and picture frames, but also magnets (I must have missed that in the description). I only wish that they were a little bigger, since any picture has to be cut in order to fit in the frame. I will use these as party favors for my upcoming holiday party and I am certain that my guests will be as charmed by these snowflakes as I am!! Paired them with Angel Candles for an Angels in Snowflakes theme. Love this item. Dual purpose for my winter wedding Using as place cards as well as favors. I also purchased silver snowflake boxes for candy which I will put on top of those. Love them! I bought these favors for my sister's winter themed baby shower. I really liked the multi-uses for them (magnet, ornament, frame). Some of the platic parts of the snowflake were a little defective and the backings were low quality as well as the glass inside it. They were all chipped and broken on the edges. If they were of better quality it would have given 5 stars. I ordered these to give as gifts to family with a picture of my son inside. Everyone LOVED them. What I liked best was the versatility of using it as an ornament, a refrigerator magnet, or as a frame. Awesome product! FYI- Wallet sized pictures work well for the frame as long as the part of the picture you are interested in is less than 1/3 the total size of the wallet-sized picture. Gave them as stocking stuffers and tied them onto packages as gift tags. Great personalized gift on a budget. This made a great gift to give to a large group as the more you bought the more you saved. I bought them for my gymnastics team and the parents loved the personalized gift and I loved I could do it at such a reasonalbe price. They were easy to add your own picture and looked very nice when completed although they were plastic. I really liked that they were a hanging ornament, frame, or magnent. Q:What is the actual size of the octagonal window in this ornament? A:The picture window is approximately 1.25" W x 1.25" L in an octagonal shape. Q:How big is the space for the actual photo? Q:what size picture can we put in it? 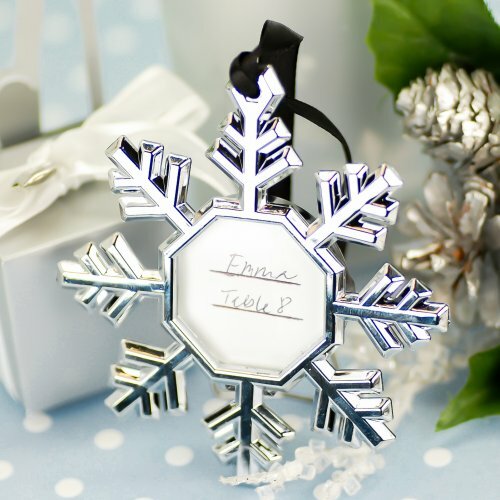 These snowflake ornament place card holders are whimsical winter wedding favors that double as heart-warming holiday gifts. Here's a great idea for your holiday party: slip a place card with a name and table number on each, then hang all from the Christmas tree. As guests arrive, they can pluck their snowflake ornaments from the tree to find their seat assignments! Each snowflake features an octagonal window for a place card or photo and, plus plenty of built-in ways to display: a foldout stand to use as a place card holder; black ribbon to hang as an ornament; and a magnet to display anywhere! Made of silver coated hard resin plastic and measures 3.75"L x 3.25"W and available in a set of four and matching place cards included.